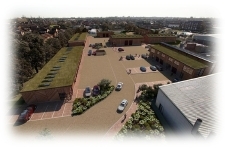 LEAN Flexibles is proud to be part of The Greenfields Industrial Park, a £4 million scheme to develop Hinckley and Bosworth's first 'Green' Enterprise Park. This has utilised the latest in sustainable building technology to create a BREEAM rated 'Very Good' estate. Cedar Timber Cladding - providing a lower 'carbon footprint' by utilising re-usable and sustainable materials. Living 'green' roof planted with sedum (low-growing, succulents) - providing a high level of insulation, reducing energy costs and cutting rainfall run-off by up to 90 per cent. Wind turbines on office building – providing a sustainable source of energy. Low emissions from heating system, efficient thermal properties supported by pleasant working environment. Permeable paving - reducing rainwater run-off. Water efficient sanitary ware to reduce water consumption.